SATRA technical experts will be in Dongguan in May 2019 to present detailed seminars on the latest developments in footwear and personal protective equipment (PPE). 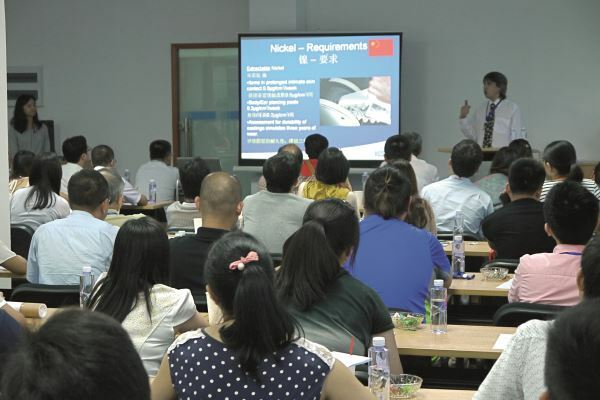 Six half-day or full-day seminars are to be held between May 14th to 17th in SATRA’s China office, with all sessions being presented in English with Chinese translations. The morning sessions will run from 09:30 to 12:30, with the afternoon programme lasting between 13:30 and 16:30. All sessions are free for SATRA member companies, with non-members paying 150RMB on the door for the open sessions on Tuesday morning and Thursday. SATRA’s REACH seminar provides a clear understanding of the legislation for all personnel within the supply chain, and offer practical guidance on the relevant laboratory testing that would be applicable to particular products. Customers have high expectations of specialist outdoor footwear. This session examines the testing of thermal properties, moisture management, water resistance and physical comfort. Delegates to this session will discuss the physical and chemical tests recommended to ensure that footwear is safe and suitable for use, and will consider testing using toy standards, chemical testing, general testing and fitting. SATRA has helped many companies bring their new ideas to reality. This seminar discusses some of the challenges that can be encountered, how they can be overcome, and how new innovations can invoke changes to test methods. EN ISO 20344 physical and chemical testing will be covered, as well as additional tests for motorcyclists’, firefighters’ and chainsaw-resistant footwear. EU PPE Regulations will be considered in addition to certification, physical testing and innocuousness. Sole bond failures remain one of the most common causes of footwear returns. In this seminar, delegates will learn about bonding theory, types of adhesive, application, testing, and identifying failures and the errors in production from which they are indicative. This article was originally published on page 56 of the April 2019 issue of SATRA Bulletin.